Having a newborn coming into your life is an extremely special and, at times, a trying period for the new family. Many families wish to document this exceedingly extraordinary time in their baby’s life by asking a professional photographer for a photo shoot. Even when you are pregnant you may want to consider researching a newborn baby photographer and setting up a newborn photo shoot to remember the little one’s first days with the family. The first few days of baby being in the family is a great time to establish communication lines with every member of the family. When it comes to the newborn photo shoot discuss with your spouse on exactly what they would like see in the photos. Most new mom’s inclination is to avoid being in the photos with baby, but mom and dad should be in the photo to show the relationship to family and friends. What scenes would dad like to see? What backgrounds would mom like to see? Talk to each other to determine if your spouse has any hopes, plans, concerns or expectations of your newborn photographer and the photo shoot. Most photography of babies is considered individual portraits, but it is also a time to document your family’s history. It is a perfect time to include siblings with the newborn. Get talking to your newborn baby photographer to see if they have any ideas on how to show the children together that will allow the children to be excited about the photo shoot process. Your photographer may ask to complete the photos with the siblings first to give them a shorter time of waiting and then turn them loose to burn off some energy this will also allow them to quiet any jealousy they may have towards the baby getting all of the attention. You may a large family and you would like each house to have a copy of your new baby photos. When finding the right newborn baby photographer, be mindful of your budget and the amount as well as the sizes of the prints that you would like from the photo shoot. Newborn baby photographers may allow you to buy the rights to the digital files of the photos where you are able to print as many copies as your family needs. When you are going to see your photographer or your photographer is coming to visit you in the hospital then you need to prepare a bag for all of the items that you would like in the photos. Whether it is a special blanket that a favorite aunt made or a specific outfit such as one your spouse wore when he was a baby; pack these items so your photographer can determine the best setting for these shots. If you are thinking of keeping a plain background then items that have texture to them add the best visual interest. But, for clothes choose outfits that are slightly plain and not as visually stimulating or busy because this will distract away from baby. The same holds true for mom’s clothes. The louder the wardrobe the more it will distract the eye away from your baby. Other items for mom or dad should also be packed such as a favorite sweater for dad or a simple outfit for mom. Don’t forget personal care items such as eyeliner or some foundation to look your best for photos that might be seen by generations of your family tree. For both mom and dad you are going to have close up shots on your hands and possibly your feet, consider manures or pedicures. Newborn sessions should be scheduled within the first 14 days of life, but the best days are between 7-10 days of life. After day 14, babies discover that there is room in their new world and they discover the joy of stretching, so expect a fight. 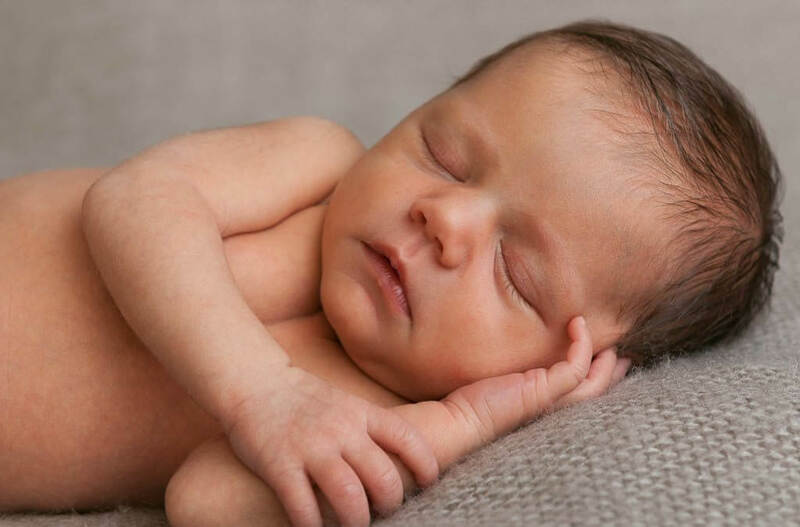 If you would like to have the classic newborn baby poses attempt to get baby in a deep sleep that comes very easily within the first 14 days of life. Babies become prone to newborn acne and sometimes colic that tend to flare up at or shortly after the 2 week old mark, if you would like to have baby’s skin looking like there is very little retouching done, then schedule the photo shoot with your newborn baby photography before that age. If you choose to have the photo shoot in your home then turn up the heat in your home so baby can sleep comfortably without any clothes. Before the photographer arrives or before the photo shoot session, loosen any clothing or diapers at least 30 minutes before the start time to get rid of any clothing lines or diaper imprints. A lot of newborn baby photos tend to be with the baby in the buff. That being said, expect to have a least one clean up session during the photo shoot. Relax and understand that your newborn baby photographer has experienced this before. If your newborn baby photographer provides any of the props for the photo shoot ask if the blankets, hats, and other items have been washed between photo shoots. No one understands your child more than you do, however if you have chosen a great newborn baby photographer you can trust that they will get some wonderful photos of you and your child so there is no need to stress. Of course, if there is something you are not comfortable with then say something! Your photographer will do their very best to put you at ease while the photo shoot is going on, so it is okay to relax.